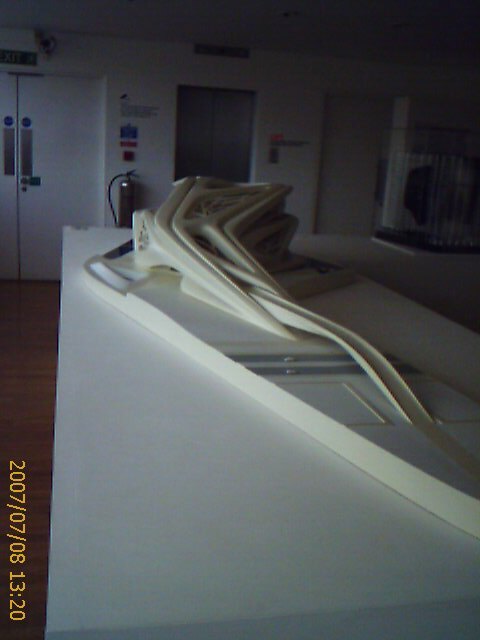 I’m in two minds about Zaha Hadid at the Design Museum. Frank Lloyd Wright = put lots of little folded-paper chairs and things inside the box and call it his building. Frank Gehry = crumple the box into a random blob and call it his building. Norman Foster = replace the cardboard with clingfilm and only reuse the staples. Le Corbusier = shrug and say the box was already a complete building. Now if you’re being cruel, you’d say Zaha would leave the box alone and instead paint a picture of it. For decades, she was the architect of the greatest buildings that… never got beyond a design study. But in the last five years her portfolio has exploded. The new exhibition (once you get past the vibrant paintings of a Hongkong building that never was) concentrates on her built work, almost all of which is 21st century. So now, what Zaha would do, of course, is make you look at the box through a distorting lens that played around with its perspective. She occupies a conceptual space somewhere between Frank Lloyd Wright and Frank Gehry: smooth sinuous forms like Gehry, yet with a whimsical nod towards homespun materials like Wright. Her furniture looks like something from a 70s sci-fi movie, yet it’s plain MDF with a lacquer coat. Yet the exhibition left me strangely unmoved. Hadid’s creations are undoubtedly great buildings, and a credit to our planet’s built environment. Yet there wasn’t enough (in this exhibit) of her buildings in situ, showing them as real moving parts in their city-machines. Too many idealised models, not enough interaction with the business of the world. Not enough proof to answer the basic question of any piece of architecture: does it work? I’ll still enjoy the Leipzig BMW building, the Zaragoza Expo bridge, the London 2012 Aqua Centre (bastardised as the design has been.) But I need more proof before acknowledging Zaha as more of a great architect than a great artist.